When I cook, I want it to be easy, straightforward and give me a delicious, nutritious dish when I'm done. I do NOT want to slave over a hot stove all day! Do you feel the same way? Unless you're a chef and it's what you love to do... I'll be honest, I don't cook much because my husband is ridiculously talented in the kitchen and he cooks for me (I am blessed!) but when I do cook, I also want to enjoy the process and know I'm making something that will make me feel great instead of gross. So that means EASY with real, whole ingredients, cooking from scratch and not using a junky mix out of a box. Don't be intimidated. If I can do it, you can too! These are 3 recipes I love that are super easy to make, healthy, and most importantly, delicious ! Healthy food doesn't have to taste like sawdust. As my husband says, "It's not good for me if I won't eat it!" When I made my first meal in the rehab hospital (it was a task I had to do as part of my occupational therapy), I chose what I thought would be easy. Grilled cheese and boxed mac'n'cheese. The mac'n'cheese is JUNK, I know, but back then I was taking it one step at a time. I just wanted to make some food and not burn the building down! And the building remains! Woohoo! Except I totally burned the grilled cheese. Like burned it black. So my confidence in the kitchen was not at its highest and I didn't cook much at all for a few years. With a TBI, I realized how much divided, focused attention cooking requires and it was HARD. And really tiring. It's still not the easiest thing for me if I try to do too much. Which I do, often, because I still have that pesky high achiever thing going... but if I stick with what works and I go easy on myself with stuff like one-pot meals or food that doesn't require focused attention for long, I do fine. Reheating leftovers is still a go-to for me but I can cook stuff now without resorting to processed garbage out of a box or the frozen food aisle. Since nutrition was so integral to my healing to this point and remains crucial to supporting a healthy brain and body, my husband and I usually cook things from scratch (we get restaurant takeout - never fast food - sometimes like any normal person, too) and make the effort to choose healthy ingredients to prepare. Most convenience foods will have preservatives, artificial additives and low quality, cheap, ingredients designed to save the company money (not boost nutrition). If you follow The Food Babe, she's been instrumental in shedding light on what's really in our processed food and getting companies to remove some of their harmful ingredients from their products. I don't love or agree with EVERYTHING she posts, but she is doing what companies and our government will not do. It's worth looking at her investigations to see some of the truth about what's in processed foods. The easiest way to avoid all that processed "food" that's so unhealthy... is to cook. Not prepare or assemble something from a package yourself, but cook it from scratch! Like I said, I don't want to spend hours in the kitchen. I get tired if I stand or have to focus for too long so I need to be able to make healthy food quickly and easily! These are 3 recipes I love and hope you do too. They also happen to be gluten free! If you follow me on social media, you probably saw me post this photo on Friday! This is the granola and it is so so good! When you make it, let me know how it goes in the comments below! • 1/4 - 1/2 cup of local raw honey or real maple syrup - 1/2 cup honey will make granola quite sticky and sweet, less will still make a delicious (less sweet) granola. Warm the coconut oil (stovetop or microwave) until it's runny and pourable. Pour over the oats and mix well, coating oats evenly. Spread oats on a baking sheet as evenly as possible. Bake for about 20-25 mins, stirring every few minutes until toasted and light brown. Let cool. Warm honey/maple syrup until very runny and easily pourable. Add cooled oats to a mixing bowl. Add almonds. Pour warm honey/maple syrup over oats and almonds and mix well, coating evenly (pictured above). Add remaining raw ingredients (seeds, coconut, dried fruit) and mix well (pictured left). As it cools, the honey will get sticky and hard. If you spread the mixture on a cookie sheet to cool, it's easier to break apart and add to your chosen storage container. If broken into large chunks, it makes a great snack to bring with you in a bag or container. If broken into smaller pieces and eaten with plain yogurt, organic milk or a unsweetened non-dairy milk, it's an awesome, filling granola for breakfast or a snack! I love sliced bananas or fresh berries on mine in the morning. • 1 teaspoon balsamic vinegar or white wine. In the pot you will use to cook the quinoa, sautee onion in butter (grassfed, organic if possible!) with a large pinch of salt, over med-low heat until translucent. Add sliced mushrooms and stir until they start to soften. Add a tsp/capful of balsamic vinegar or wine - adds flavor and helps deglaze the pot. Add the chopped garlic (I got a little jar of pre-chopped garlic to make preparation even easier!) and stir. We REALLY like garlic so if you don't want it, don't add it, or add less! Totally up to you. Add the cup of quinoa to the pot with the onions, mushrooms and garlic and stir to coat. Immediately add 2 cups of broth. Cover pot! Bring to a boil, immediately reduce to simmer and allow to cook, covered over low heat, for 15 minutes. After 15 minutes, add the kale directly on top of the cooking quinoa - it should just about fill the pot - and re-cover for 5 minutes! The kale will wilt and reduce in volume in a big way, and the quinoa will finish cooking. Cooking the kale with the quinoa this way helps conserve nutrients that would get lost if it were steamed or sauteed alone because the water in the kale goes into the quinoa. Remove the cover and remove from heat. 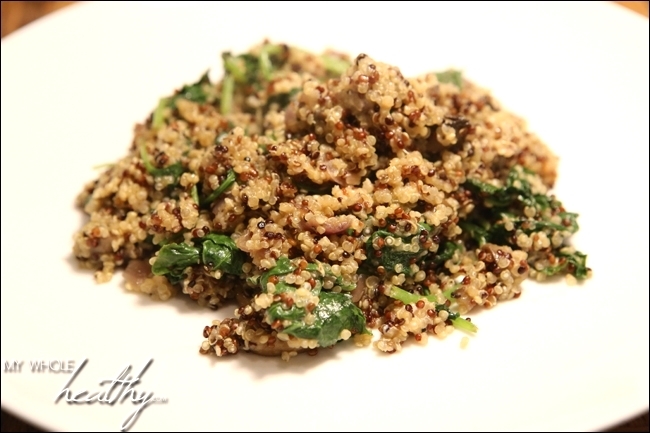 Quinoa should be moist and soft (not mushy) with no water remaining in the pot. Crumble feta cheese over the cooked quinoa and kale, and stir! You are done! Delicious, healthy food awaits. And if you, or your kids, won't eat kale alone, this is a great way to sneak it into a meal. This recipe has a lot more components and steps than the others, but if that intimidates you, just try one thing! The tartar sauce can be made ahead of time so try making that the day before. It's EASY. 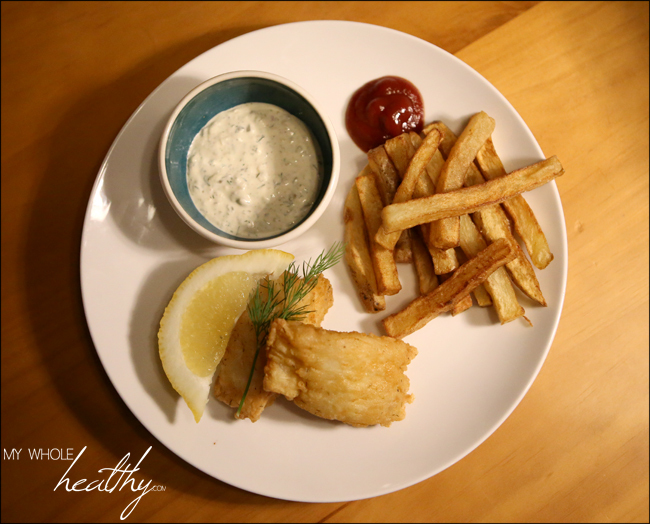 You could have the fish alone or with steamed veggies, or the fries as a side dish in another meal... both keep warm in the oven really well while you throw together something else to go with them. Lots of ways to try cooking each part until you're comfortable doing it all! And I know... fish'n'chips.... HEALTHY? Is she crazy?! If it weren't for potatoes producing acrylamide when heated to high heat (and to some extent the fish batter), this WOULD be pretty healthy. But there were ways to minimize the production of acrylamide during cooking and by carefully choosing your ingredients, even the tartar sauce isn't bad - especially if you only use a little for added flavor. Just don't drown your fish in it or eat it every day, and avoid burning or heavily browning the fries. Cooking the fries and fish in coconut oil is great because coconut oil is a healthy oil and a saturated fat, very stable at high heat so it will not oxidize or go rancid like vegetable oils can. It also has a slew of other health benefits. I love this version of fish and chips better than any I've tried back home on the east coast or in any restaurant anywhere. Thanks to my father-in-law for the tartar sauce recipe! • 1/2 cup sour cream - I love Green Valley Organics lactose free sour cream (or substitute greek yogurt). Eating fat does not make you fat. Just choose high quality, clean sources of healthy fats. • 1/2 cup mayonnaise - we use Sir Kensington's non-GMO certified mayo. Most mayonnaise is made with canola or soybean oils that are almost always genetically modified unless they are organic. See my What's A GMO link for why I avoid them. • 2 tbsp fresh tarragon or dill - we used dill for this. • 2 tbsp dill pickle relish - we just chopped up some dill pickles we already had in the fridge. • 2 tbsp capers, drained and minced. • 1 tbsp lemon zest, minced fine. Combine all ingredients, seasoning with Tabasco, salt and pepper at the end to taste. That's it! You will never buy tartar sauce again. • 4 medium Yukon Gold potatoes - these are a low-starch potato that won't produce as much acrylamide. They are denser and less fluffy than Russet potatoes which produces a better fry. Thoroughly wash/peel potatoes. We buy organic potatoes and like to leave the skins on. Cut the potatoes into rectangular, fry-shaped strips. Discard (compost!) any potato bits that are a lot smaller or skinnier than the rest. These pieces will burn when fried. Rinse the raw, cut fries under water to remove excess starch. Place in a bowl, cover with water and let soak for 2 hours to pull more starch out of the potatoes. These steps will further reduce acrylamide produced by cooking at high heat. Heat coconut oil in a deep pan to 340º F. Use a candy thermometer to check the temp. If the oil is too cold, the fries will be greasy. If you want do it by eye, test the heat of the oil by dropping a single piece of potato into the hot oil. If nothing really happens, the oil is still too cold. If it bubbles furiously and turns brown quickly, it's too hot! It should sizzle and bubble a little bit and turn a nice light golden brown while cooking all the way through after a few minutes. Place raw fries into the oil in small batches to avoid dropping the temperature of the oil too much. Keep frying in small batches, letting the oil come back up to 335º between batches, until light golden brown and cooked through. About 8-9 minutes. Yukon Gold potatoes are stiffer and less fluffy than Russets so they will make a denser fry. Frying at 340º instead of 350º gives them more time to book through before becoming dark brown. Place fries on paper towel to drain excess oil and salt the fries immediately as they become ready. Place on a cookie sheet in warm oven while you fry the fish. • refined coconut oil leftover from cooking the fries. Gently rinse fish in cold water and pat dry. For large filets, cut them into smaller pieces. They will cook more evenly this way. Mix dry ingredients in a large bowl. Mix water and eggs separately, then stir into dry ingredients. Mix until smooth. Lightly coat fish with extra rice flour, then place fish fillets in batter mixture. Coat well and let stand for 10-15 minutes. Heat oil to 350º F. You can use the same pan you used to fry the french fries. Don't fry the fish first, and then the potatoes! Gently place small batches of battered fish into the oil. Do small batches to avoid dropping the oil temperature. Fry until light golden brown and crispy - about 8 minutes. Turn the fillets regularly to avoid scorching the batter. Remove fish and place of paper towels to drain excess oil. Keep warm in the oven until all the fish is cooked. Serve with fries and tartar sauce! If you make any or all of these recipes, please let me know how it goes and if you like/hate them in the comments below! I'd truly love to know. Have fun in the kitchen!